Left to right: Bro. Denis (Terence Phillips), Bro. 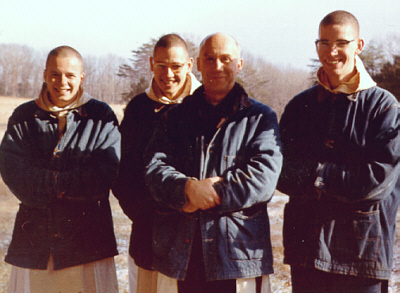 Cuthbert (Rietdorf), Thomas Merton, and an unknown novice. Thomas Merton (1915-1968), known in religion as Father Louis, was a Trappist monk of the Cistercian Abbey of Gethsemani near Bardstown, Kentucky. Merton's best-selling autobiography The Seven Storey Mountain (1948) has become a classic. His other works include The Sign of Jonas, No Man is an Island, New Seeds of Contemplation, Conjectures of a Guilty Bystander, The Way of Chuang Tzu, and Mystics and Zen Masters. Since his death in Bangkok, Thailand, in December 1968, a number of his works have been published posthumously, including The Asian Journal, The Collected Poems, The Literary Essays, and five volumes selected from his letters. His Personal Journals (1939-1968), closed for twenty-five years after his death, have been published in seven volumes. In 1967, one year before his death, Merton established the Merton Legacy Trust, naming Bellarmine College as the repository of his manuscripts, letters, journals, tapes, drawings, photographs, and memorabilia. Two years later, in October 1969, the College established the Thomas Merton Center, with the Collection as its focal point. The Center serves as a regional, national, and international resource for scholarship and inquiry on Merton and his works and also on the ideas he promoted: contemplative life, spirituality, ecumenism, East-West relations, personal and corporate inner work, peace, and social justice. The Merton Center regularly sponsors courses, lectures, retreats, seminars, Road Scholar [elderhostel], and exhibits for scholars, students, and the general public. The Merton Center in conjunction with the International Thomas Merton Society publishes the quarterly review The Merton Seasonal and supports publication of The Merton Annual. It serves as the central office for the International Thomas Merton Society, founded at the Center in 1987, and is affiliated with other international centers, such as the Thomas Merton Society of Great Britain and Ireland, and the Centro International de Estudios Misticos in Avila, Spain. The Merton Collection has grown to over fifty thousand items, including the literary estate, twenty thousand pieces of correspondence to over 2,100 correspondents, nine hundred drawings, eleven hundred photographs and six hundred hours of audio taped conferences given by Merton to his community at Gethsemani (samples), and several hundred volumes from Merton's own library. It is the largest Merton collection in the world, incorporating items translated into thirty languages, over two hundred and sixty masters and doctoral theses, audiovisual materials, and a growing collection of paintings, drawings, sculptures, and fabric art depicting Merton. The Center is located on the second floor of Bellarmine's W. L. Lyons Brown Library. The facility includes areas for study, meeting, and quiet contemplation; offices for staff; and a climate-controlled room to preserve the Merton Collection. Merton's own drawings and photographs are on display, together with a variety of artistic renditions and photographs of Merton. A special room in the Center, dedicated to Merton's parents, contains a collection of watercolors by Merton's father, Owen. "Whatever I may have written, I think it all can be reduced in the end to this one root truth: that God calls human persons to union with Himself and with one another in Christ, in the Church which is His Mystical Body. It is also a witness to the fact that there is and must be, in the church, a contemplative life which has no other function than to realize these mysterious things, and return to God all the thanks and praise that human hearts can give Him. It is certainly true that I have written about more than just the contemplative life. I have articulately resisted attempts to have myself classified as an "inspirational writer." But if I have written about interracial justice, or thermonuclear weapons, it is because these issues are terribly relevant to one great truth: that man is called to live as a child of God. Man must respond to this call to live in peace with all his brothers and sisters in the One Christ."